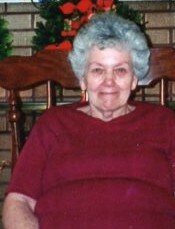 Wanda Kessinger Powell, 93 of South Louisville, passed away peacefully on Saturday April 6, 2019. Wanda was born February 23, 1926 in Grayson County, Kentucky. She was the oldest of 12 children born to Pearl and Clarence Kessinger. Her survivors are two sons Darrell Bruce (Luz) of Louisville and Thomas Wesley Jr., (Brenda) of Las Vegas, Nevada, grandchildren, Thomas (Emily) of Cantonment, Florida, Sara, LaGrange, Kentucky, Adam (Quin) of Mishawaka, Indiana, Andrew of Fern Lea, Nevada along with great-grandchildren Olivia, Tommy, Mari, Jackson. She is also survived by siblings, Tom, Brenda, Trek, Lillian, and Jim Kessinger. She was preceded in death by her husband Thomas W. Powell, Sr., son Sidney and infant twins Patricia and Patrick. She is also preceded in death by siblings, Leon, Hazel Constant, Virginia Constant, Lank, Alfred, and Betty Jean Maus. Funeral services will be held Monday at 1:00 pm at Louisville Memorial Gardens Funeral Home, 4400 Dixie Highway. Visitation will be Monday from 10:00 am until time of service.